Prevent electrostatic discharge (ESD) from damaging electronic components, such as computer motherboards and hard drives, during repair and maintenance. 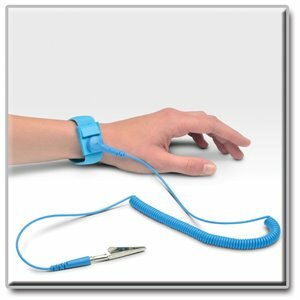 Tripp Lite’s P999-000 Anti-Static Wrist Strap with Grounding Wire is an easy, inexpensive way to dissipate static charges from your body while you work on sensitive electronic equipment. A conductive carbon interior coating on the wristband controls static to protect sensitive electronics. The wristband is adjustable to provide a custom fit and the 2 ft. strap stretches to 6 ft. for freedom of movement. The strap has molded ends for durability. Use the alligator clip for connection to ground. The P999-000 has a ground resistance of 106 ohms and an electrostatic discharge time of 0.1 seconds. The P999-000 comes backed by a lifetime product warranty and is manufactured in compliance with strict RoHS specifications, reflecting Tripp Lite’s commitment to environmental responsibility. 2 ft. long strap stretches to 6 ft.